Obstructive sleep apnea (OSA) is a common sleep disorder characterized by collapse of the pharyngeal airway during sleep. This results in cessations or significant reductions of airflow known as apneas and hypopneas, which ultimately lead to behavioral and cardiovascular morbidity. It is estimated that 1 in 20 adults has obstructive sleep apnea with daytime impairment, but up to 5% remain undiagnosed. Tracheotomy was the mainstay of treatment for obstructive sleep apnea until 1981, when continuous positive airway pressure (CPAP) was introduced. [4, 5] Lifestyle modifications, including weight loss and CPAP, are first-line treatment methods for obstructive sleep apnea. If these fail, uvulopalatopharyngoplasty and other surgical treatment may be considered. The soft palate marks the beginning of the oropharynx and it is the mobile posterior third of the palate. It forms an incomplete septum between the oral cavity and the pharynx. It is marked by a median raphe and is continuous with the roof of the mouth and the mucous membrane of the nasal floor (see the image below). Hard and soft palate anatomy. 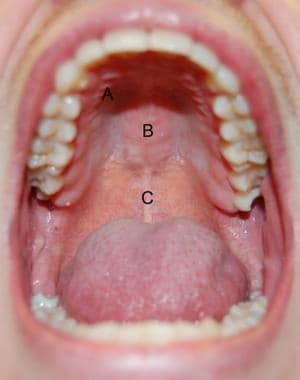 A: transverse rugae of hard palate; B: median raphe of hard palate; C: median raphe of soft palate. When the soft palate is relaxed, its anterior surface is concave and its posterior surface is convex. The anterior aponeurotic portion is attached to the posterior border of the hard palate, and the posterior muscular portion hangs between the mouth and the pharynx and is termed the palatine velum (or velopharynx). The velum is prolonged by a median free process termed the uvula and 2 bilateral processes termed the palatoglossal and palatopharyngeal arches or pillars, which join the soft palate to the tongue and pharynx, respectively. The fauces represent the space between the oral cavity and the oropharynx. They are bounded superiorly by the soft palate, inferiorly by the root of the tongue, and laterally by the pillars of the fauces. For more information about the relevant anatomy, see Mouth Anatomy, Throat Anatomy, Tonsil and Adenoid Anatomy, and Pharynx Anatomy. If a patient is unable to tolerate CPAP therapy, then surgery can be considered. General indications for surgical intervention include mild obstructive sleep apnea with excessive daytime fatigue, an apnea-hypopnea index of 15 or more, oxyhemoglobin desaturation less than 90%, and/or cardiac arrhythmias associated with obstructions. Initially, the success rate of uvulopalatopharyngoplasty was reported to be less than 40%, with success defined as a reduction of respiratory disturbance index by 50% and an apnea-hypopnea index less than 10 or a respiratory disturbance index less than 20. However, this low success rate was probably related to patient selection. A staging system based on palate position, tonsil size, and body mass index was then established to aid with patient selection. [7, 8] Stage I patients had a palate size of 1 or 2 based on a modified Mallampati scale and tonsil size of 3 or 4 based on the Brodsky scoring system. These patients are the best candidates for surgery with a reported success rate of 80.6%. Stage II patients have a palate position and tonsil size of 3 or 4. Their success rate following uvulopalatopharyngoplasty was 37.9%. Patients with a body mass index greater than 40 kg/m2 were classified as stage III and had a success rate of only 8.1%. These findings reiterate the need for proper patient selection and counseling prior to surgery. Sleep endoscopy may be used to identify the area(s) of airway collapse. This procedure involves inducing sleep pharmacologically and then performing flexible fiberoptic nasopharyngoscopy to evaluate the airway. It is usually performed in the operating room under general anesthesia. During the procedure, the location of collapse (ie, nasopharyngeal, oropharyngeal, and/or hypopharyngeal) and the specific structures causing obstruction are identified to guide future surgical intervention. It is useful for patients undergoing primary surgery and those who have failed surgical intervention in the past. The type of surgery offered to each patient is individualized based on the level of airway obstruction. Obstruction can occur at the nasal, retrolingual, and/or retropalatal levels. Obstruction at purely the nasal level may require a septoplasty, inferior turbinate reduction, adenoidectomy, polypectomy, and/or nasal valve reconstruction. Airway obstruction at the retropalatal and/or retrolingual level can be approached using the protocol established by the Stanford Sleep Disorders Center. In this protocol, surgery is offered in 2 phases. Phase I is further divided based on the patient’s anatomy. Patients with type 1 anatomy have a purely oropharyngeal (ie, retropalatal) obstruction and are treated with uvulopalatopharyngoplasty. Patients with type II anatomy have oropharyngeal and hypopharyngeal obstruction and are treated with uvulopalatopharyngoplasty, genioglossus advancement, and possible hyoid myotomy. Patients with type III anatomy have hypopharyngeal obstruction alone and are treated with genioglossus advancement. Success of surgery is defined as a reduction in respiratory disturbance index by 50%. Phase II surgery consists of a maxillary-mandibular osteotomy and is offered to patients who fail phase I. The success rate is reported to be 97-100% when patients undergo both phases. All patients undergoing uvulopalatopharyngoplasty require general endotracheal anesthesia. Given that many patients with obstructive sleep apnea are overweight and have cardiovascular disease, they should be evaluated by the anesthesia team prior to surgery so that a stepwise approach to airway management is planned preoperatively. After the induction of adequate general endotracheal anesthesia, a shoulder roll is placed using a blanket or towel. Care should be taken to make sure the head is supported during the procedure to avoid ligamentous or cervical spine injury. The eyes should be taped shut and padded. The surgeon should be careful during draping not to tape the drapes to the endotracheal tube. An oral tracheal tube is taped in the midline of the lower lip to allow for proper mouth prop placement and tongue retraction. If a patient is admitted overnight, continuous pulse oximetry should be ordered. Intravenous dexamethasone at a dose of 8 mg every 8 hours can be administered to help with postoperative swelling. Patients can have severe pain following surgery, but pain control must be balanced with the side effects of narcotic pain medication, specifically respiratory depression. A repeat polysomnogram should be performed at 3-6 months to determine response to therapy and need for further therapies. A single dose of 8-10 mg of intravenous dexamethasone can be administered prior to surgery. Antibiotics are not necessary. The surgeon should wear a headlight for illumination during the procedure. A mouth prop (McIvor or Crowe-Davis) is used to gently open the oral cavity and is suspended from a Mayo stand. An appropriately sized tongue blade should retract the tongue without touching the posterior oropharyngeal wall. The tongue and endotracheal tube should be positioned in the center of the tongue blade. If the tongue is particularly large, the blade may need to be positioned for removal of the first tonsil, followed by repositioning prior to removal of the other tonsil. The hard palate is then palpated for the presence of a submucosal cleft. If a submucosal cleft is present, surgery should be avoided because of the possibility of postoperative velopharyngeal insufficiency. The anterior tonsillar pillar mucosa is incised just lateral to its reflection onto the tonsil. Dissection proceeds along the tonsil capsule in an avascular plane until the entire tonsil is removed. A similar procedure is used to remove the contralateral tonsil. Attention is then turned to the soft palate. The aim of this portion of the surgery is to resect the inferior portion of the soft palate along with the uvula in a skiving fashion such that more nasopharyngeal than oropharyngeal mucosa is preserved. A horizontal incision is made along the soft palate mucosa just anterior to the uvula and connected to the superior edge of the previously made anterior pillar mucosa incisions. The incision is carried down through the mucosa to the tensor veli palatini muscles. Beveled dissection proceeds towards the uvulae muscle until the redundant soft palate and lateral pharyngeal mucosa is resected. Hemostasis is achieved using electrocautery. Different suturing techniques and materials have been described. For example, 2.0 Vicryl sutures may be used in a horizontal mattress fashion at the corners of the soft palate to bring the nasopharyngeal and oropharyngeal mucosa together in a single layer. The knot of the suture is placed on the oropharyngeal surface. Several interrupted stitches or running sutures are then used to reapproximate the remainder of the soft palate mucosa. The inferior-most tonsillar fossae mucosa is left open in case of postoperative bleeding. For post-operative analgesia, 6-10 mL of 1% bupivacaine in 1:200,000 epinephrine is then injected into each tonsillar pole and the soft palate. During injection, extreme care should be taken to withdraw prior to injection to avoid intravascular injection of bupivacaine with resultant severe complications, including cardiovascular collapse. Complications of uvulopalatopharyngoplasty include nasopharyngeal stenosis, velopharyngeal insufficiency, and globus sensation. To minimize these risks, modifications to uvulopalatopharyngoplasty with uvula preservation have been described. [16, 17, 18] Surgical options include complete uvula preservation or uvular muscle resection with mucosal preservation. With complete uvular preservation, a larger portion of the soft palate is resected to increase the oropharyngeal airspace. A microscope or loupes can be used to assist with muscle identification. A mucosal incision is made on either side of the uvula and connected with the tonsillectomy anterior tonsillar pillar incisions. The soft palate mucosa and adjacent adipose tissue are removed, with care taken to preserve the levator and tensor veli palatine muscles. The soft palate mucosa is then closed as described above. Scar tissue contracture eventually gives the uvula a normal appearance and location within the oropharynx. In uvular muscle resection with mucosal preservation, a horizontal incision is made at the base of the uvula similar to a normal uvulopalatopharyngoplasty procedure. The mucosa overlying the uvula is then undermined and 1–1.5 cm of full-thickness uvula muscle is resected with sharp scissors. The overlying mucosa is then sutured as is a traditional uvulopalatopharyngoplasty. These modifications may have surgical success rates similar to traditional uvulopalatopharyngoplasty procedures with less postoperative complications. Fujita S, Conway W, Zorick F, Roth T. Surgical correction of anatomic azbnormalities in obstructive sleep apnea syndrome: uvulopalatopharyngoplasty. Otolaryngol Head Neck Surg. 1981 Nov-Dec. 89(6):923-34. [Medline]. Young T, Peppard PE, Gottlieb DJ. Epidemiology of obstructive sleep apnea: a population health perspective. Am J Respir Crit Care Med. 2002 May 1. 165(9):1217-39. [Medline]. Young T, Skatrud J, Peppard PE. Risk factors for obstructive sleep apnea in adults. JAMA. 2004 Apr 28. 291(16):2013-6. [Medline]. Sullivan CE, Issa FG, Berthon-Jones M, Eves L. Reversal of obstructive sleep apnoea by continuous positive airway pressure applied through the nares. Lancet. 1981 Apr 18. 1(8225):862-5. [Medline]. Marvisi M, Vento MG, Balzarini L, Mancini C, Marvisi C. Continuous positive airways pressure and uvulopalatopharyngoplasty improves pulmonary hypertension in patients with obstructive sleep apnoea. Lung. 2015 Apr. 193(2):269-74. [Medline]. Sher AE, Schechtman KB, Piccirillo JF. The efficacy of surgical modifications of the upper airway in adults with obstructive sleep apnea syndrome. Sleep. 1996 Feb. 19(2):156-77. [Medline]. Friedman M, Ibrahim H, Bass L. Clinical staging for sleep-disordered breathing. Otolaryngol Head Neck Surg. 2002 Jul. 127(1):13-21. [Medline]. Friedman M, Ibrahim H, Joseph NJ. Staging of obstructive sleep apnea/hypopnea syndrome: a guide to appropriate treatment. Laryngoscope. 2004 Mar. 114(3):454-9. [Medline]. Riley RW, Powell NB, Guilleminault C. Obstructive sleep apnea syndrome: a review of 306 consecutively treated surgical patients. Otolaryngol Head Neck Surg. 1993 Feb. 108(2):117-25. [Medline]. Hathaway B, Johnson JT. Safety of uvulopalatopharyngoplasty as outpatient surgery. Otolaryngol Head Neck Surg. 2006 Apr. 134(4):542-4. [Medline]. Mickelson SA, Hakim I. Is postoperative intensive care monitoring necessary after uvulopalatopharyngoplasty?. Otolaryngol Head Neck Surg. 1998 Oct. 119(4):352-6. [Medline]. Franklin KA, Haglund B, Axelsson S, Holmlund T, Rehnqvist N, Rosén M. Frequency of serious complications after surgery for snoring and sleep apnea. Acta Otolaryngol. 2011 Mar. 131(3):298-302. [Medline]. Kezirian EJ, Weaver EM, Yueh B, Deyo RA, Khuri SF, Daley J, et al. Incidence of serious complications after uvulopalatopharyngoplasty. Laryngoscope. 2004 Mar. 114(3):450-3. [Medline]. Jiang RS, Chang YH. Olfactory loss after uvulopalatopharyngoplasty: a report of two cases with review of the literature. Case Rep Otolaryngol. 2014. 2014:546317. [Medline]. [Full Text]. Setabutr D, Adil EA, Adil TK, Carr MM. Emerging Trends in Tonsillectomy. Otolaryngol Head Neck Surg. 2011 Mar 11. [Medline]. Shin SH, Ye MK, Kim CG. Modified uvulopalatopharyngoplasty for the treatment of obstructive sleep apnea-hypopnea syndrome: resection of the musculus uvulae. Otolaryngol Head Neck Surg. 2009 Jun. 140(6):924-9. [Medline]. Kwon M, Jang YJ, Lee BJ, Chung YS. The effect of uvula-preserving palatopharyngoplasty in obstructive sleep apnea on globus sense and positional dependency. Clin Exp Otorhinolaryngol. 2010 Sep. 3(3):141-6. [Medline]. Han D, Ye J, Lin Z, Wang J, Wang J, Zhang Y. Revised uvulopalatopharyngoplasty with uvula preservation and its clinical study. ORL J Otorhinolaryngol Relat Spec. 2005. 67(4):213-9. [Medline]. Cruz IA, Drummond M, Winck JC. Obstructive sleep apnea symptoms beyond sleepiness and snoring: effects of nasal APAP therapy. Sleep Breath. 2011 Mar 2. [Medline]. In this video clip, the tonsils have already been removed. The amount of tissue removal is examined by reflecting the uvula forwards. The redundant mucosa of the soft palate and uvula is removed in this technique, without removal of the underlying muscle. Many Vicryl sutures are placed within the soft palate to realign the uvular remnant. The redundant soft palate and tonsillar pillars are closed in a similar manner. Video courtesy of Vijay R Ramakrishnan, MD. Medscape Reference thanks Vijay R Ramakrishnan, MD, Assistant Professor, Department of Otolaryngology, University of Colorado School of Medicine, for the video in this article.